±Eligibility subject to Fédération des caisses Desjardins du Québec’s approval. Certain conditions apply. Cannot be combined with any other promotional offer. Sign up offer available only on a new Reno-Depot CONTRACTORS commercial credit card opening. The discount is valid on the first in-store purchase, paid with the commercial RENO-DEPOT Credit card and on presentation of the coupon. The discount offer is valid on any merchandise purchase of $ 500 and more before taxes, on the same invoice. Offer applicable on regular price and on special orders. Offer does not apply on (i) costs of services offered in store such as installation, delivery, rentals, cut services, etc. and (ii) purchase of appliances, gift cards, previous purchases, layaways, in-store accounts or clients holding specific contractual agreement. Not convertible into cash. 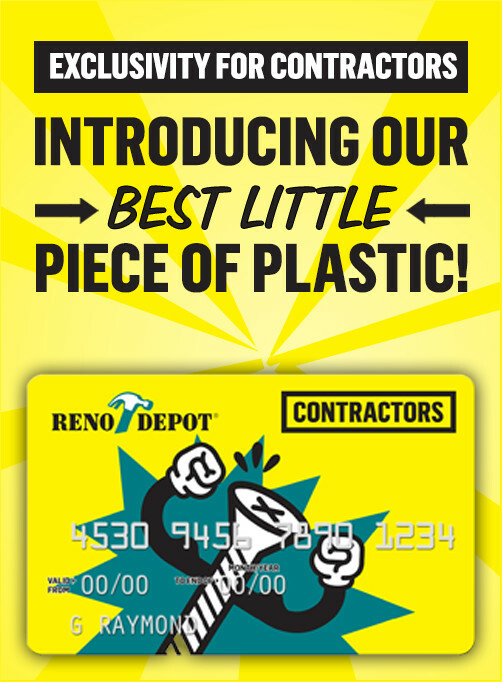 The RENO-DEPOT commercial CONTRACTORS Credit card is addressed to business only. This offer may end or may be changed without notice. *Federation des caisses Desjardins du Quebec annual prime rate in effect at the time of purchase, plus 6%. ®/TM Trademarks of AIR MILES International Trading B.V. used under license by LoyaltyOne, Co. and © 4536631 Canada Inc (RENO-DEPOT).